Amongst my many cookbooks, I have already talked about my recipe categorizing technique, which consists in placing strategic post-its that stick out and serve as gentle reminders of recipes from my to-cook wishlist. Sometimes those sticky notes stay there for months, and even get yellow from old age. They do! A new era has been reached however. And the reason is my food blog. Since I started blogging, not only did I start (or resume according to P.) a cookbook buying frenzy, but I also grew a cooking boost that does not seem to see or reach a close end. Do you think this is a disease? I so much want to cook all the time. I have such a strong desire to cook that I wish I could have friends over every night. And so as I was flipping through the pages of a favorite cookbook, I stopped on a sticky note and Aha! 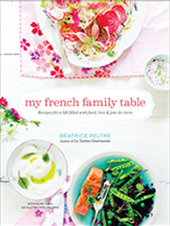 Time to make this recipe that I had fallen in love with and bookmarked since my return from New Zealand in February. I would not let this sticky note turn yellow. It was pretty easy for this dish to seduce me. Fresh like the summer I had just left behind, lemon as I adore all zesty things, and it both featured fennel and fresh raw salmon, a combination of refreshing colours to make a fresh appetizer. 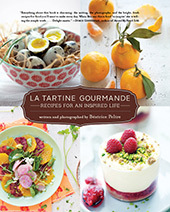 Fresh is the cookbook that it is coming from. Fresh, fresh, fresh. I would be willing to tell you a joke but I would be one of the few people to understand it. Let’s just say that whenever I utter the word “fresh“, I have to smile. It reminds me of my dear kiwi friend Sandra who has a thing about using the word fresh like we breathe air. Sandra, Keith, P, you all know what I mean. Sandra loves fresh salads, fresh fruit, fresh fish, fresh fresh fresh! And don’t we love when we hear Sandra say with her cute kiwi accent: “Fantastic! I would like a fresh salad!” (imagine the kiwi vowels on the word fantastic and fresh if you can). If anyone ever meets Sandra (which is likely if you go to Wellington in New Zealand, you know, because of the 2 degree separation that exists down there), you will love to hear her speak freshly. 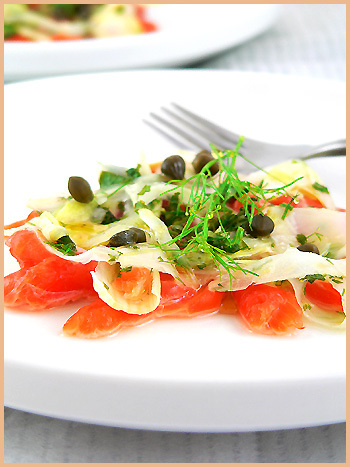 I am happy to introduce you to a simple Fennel Salmon Carpaccio. Wash the fennel and remove the green feathery parts. Slice the bulb paper thin. You might need the help of your mandoline if you think you cannot slice super thinly. Chop the feathery parts of the fennel green, the mint and dill. Mix together the sea salt, the chopped herbs, the sugar and lemon juice and pour over the fennel slices. Mix well. Cover and place in the fridge for a min of 1 hour (I went with 2 hours). Wrap your fish in plastic wrap and place it in the freezer for 30 mns so that it is easier to slice it. The flesh gets firmer. Take it out and slice it paper-thinly. Take appetizer plates and arrange a layer of salmon on top. Top with the fennel slices and then pour a dash of olive oil on each plate. Add the capers and decorate with a few sprigs of feathery fennel greens. Serve immediately because the lemon juice cooks the fish quickly. Fresh appetizer. To you Sandra! Lavez le fenouil et ne gardez que la bulbe et les petites feuilles vertes. Coupez la bulbe en tranches très fines, de l’épaisseur d’une feuille de papier. Utilisez une mandoline si vous en avez une. Ciselez la menthe, l’aneth et le vert du fenouil très finement. Pressez le jus du ciron. Mélangez le sel de mer, les herbes, le sucre et le jus de citron, et dans un bol, recouvrez-en le fenouil. Mélangez bien, couvrez et mettez le fenouil au réfrigidaire pendant une heure min. (je l’ ai laissé 2 heures). Emballez votre poisson dans du film plastique et mettez le au congélateur pendant 30 mns, de manière à raffermir la chair pour mieux découper le poisson. Sortez-le et coupez-le en tranches très fines, de l’épaisseur d’une feuille de papier. Sur des assiettes, arrangez une couche de saumon. Placez le fenouil au-dessus et arrosez d’huile d’olive. Décorez avec des câpres et un peu plus de vert du fenouil. Servez immédiatement car le jus de citron cuit le poisson rapidement. I wish that I could be one of your friends over for dinner every night! Love to cook, but lately have difficulty finding the time. I will admit that sometimes supper amounts to not much more than beer and a hot dog. I am grateful that in Italy I can find salmon carpaccio aside from swordfish, trout, and another type that I can’t remember the name of. Really makes for an easy appetizer before a seafood dinner! You can’t see this but my mouth’s agape and drool is dripping. I love love love this dish and I’m so hungry now! kia Ora (hello) from a blogger down under in New Zealand. What a lot of food blogs you have listed. chaque bouchée doit fondre dans la bouche et parfaitement relevé par le fenouil. Bonjour les filles et bonne journée à vous trois. C’est dans l’air du temps 🙂 Anne, toi, et j’avais fait aussi qque chose dans le genre il y a qques semaines. Decidement AnneE et toi avez des inspirations communes en ce moment, pour notre plus grand bonheur. Je viens de rentrer, et je n’ai malheureusement pas le temps de tout lire, mais je reviendrai, notamment sur cette jolie recette de fraises au Lillet qui m’attire tres fort. On est bien chez toi Bea! Fenouil et saumon sashami… Miam! The Post it sticky things- yes i hear you! i do the same! As always, looks gorgeous, Béa. I love fennel with salmon. 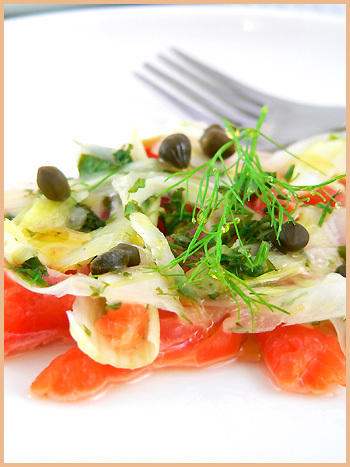 The combination of the flavors on your carpaccio sounds wonderful. At Xmas, i have eaten raw scallop, it was delicious…. This girl is killng me!!!!!!! je refais ta recette sous peu, trop beau trop bon, trop…tout! Rowena, ah my poor you! Hope you are not killing yourself with work! yes this can definitely be a dinner plate too! Kelvin, yes quite an extensive list, eh? So many good blogs out there! Anne, merci, c’est vrai que le fenouil, c’est extra et si releve! Merci Lemich Ahahah, effectivement, mais ca fait pas de mal de se nourrir les yeux et le ventre! Gracianne, merci de ton gentil mot. C’est vrai c’est bien marrant cette inspiration commune! J’espere que tu as passe de superbes vacances! Mitsuko, yes totally, ahhah, no more salmon? 😉 until when! Kim, thanks my dear. Yes i guess I know your sticky post-its technique too! Brett, thanks a lot for the nice note. Glad you like it! Fabienne, yes with scallops, it is delicious, isn’t it? Thanks again More on ceviches and carpaccios soon as I am in the mood for them. Maybe Spring around calls for those kinds of food! I am sooo making this a.s.a.p!! that’s absolutely beautiful… i honestly prefer most of my meat raw. tartares or carpaccios or any other way a different culture does it is fine by me. Merci pour le coin français! Chez les Mijoteurs, nous sommes devenus addicted à “La Tartine Gourmande”. Plusieurs recettes essayées, toutes appréciées. Celle-ci un pur régal. Je ne regrette qu’une seule chose, ma pauvre menthe du jardin était assez piteuse. Quand elle sera plus belle, je ferai à nouveau cette recette. Ah merci Mijo, ca me fait super plaisir! can you explain more on how to slice the salmon so it works for that beautiful presentation? Pessy, when the salmon is starting to freeze, it’s much easier to slice. Hence place it in the freezer well wrapped to give it its easy to slice texture. thanks, but what shape to slice it, etc? Are you aware that your photo has been stolen for use to advertise a restaurant?